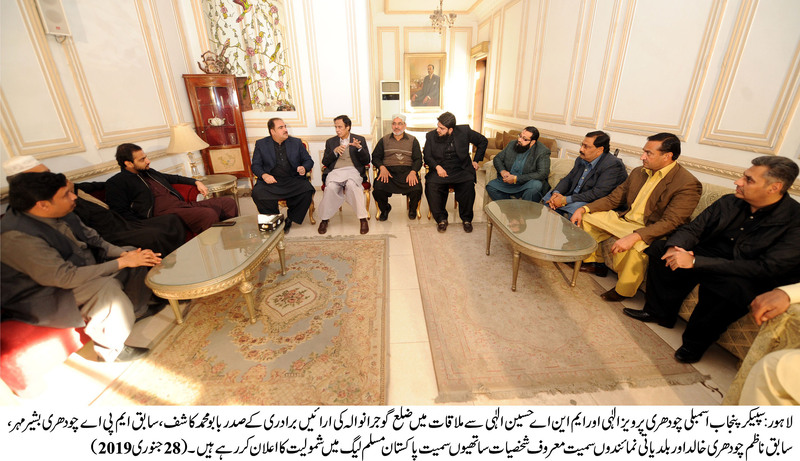 Lahore: 28-01-2019: After meeting with Speaker Punjab Assembly Ch Parvez Elahi and MNA Hussain Elahi, large number of prominent figures including Gujranwala district Araeen community President Babu Muhammad Kashif, former MPA Ch Shabbir Mehr, former Nazim Ch Khalid, and local bodies’ representatives announced joining Pakistan Muslim League (PML). They had called on them under leadership of Babu Muhammad Kashif who is also President Sabzi and Fruit Mandi district Gujranwala and President Human Rights Punjab at their residence here today (Monday). The delegation included Chairman Union Council 70 City Gujranwala Ch Ali Shaan, Chairman Saansi Jatt Union Council City Gujranwala Ch Umair Ashraf, Vice-Chairman Union Council 40 district Gujranwala Ch Muhammad Ishaq, Senior Vice-President Sabzi and Fruit Market Gujranwala Babu Qaiser Munir, Vice-President Sabzi Mandi Ch Nadeem Goga, Ch Shoaib Munir, Contractor Ch Aslam, Ch Parvaiz Mehr, Ch Asim Munir among others. Appreciating their decision, Ch Parvez Elahi said that focus of our politics s welfare, well-being and provision of basic facilities to common and poor man this is the reason that whenever we got the opportunity we had undertaken historical and ideal works, not only started mega projects in Punjab but also completed them which was never done earlier in the history.